Guests are met in Beziers** and transferred by private chauffeured minibus to Athos. A full-crew Welcome Aboard follows, with champagne and Mediterranean canapés. Once you are settled into your cabin, you will be invited to your first 4-course dinner on board, prepared by the highly skilled chef. Enjoy breakfast in a comfortable chair on the upper deck of the hotel barge, before we drive to the famous medieval double-walled city of Carcassonne. Your knowledgeable guide will provide a full tour of this historical place and ensure that you also have time to browse the shops. 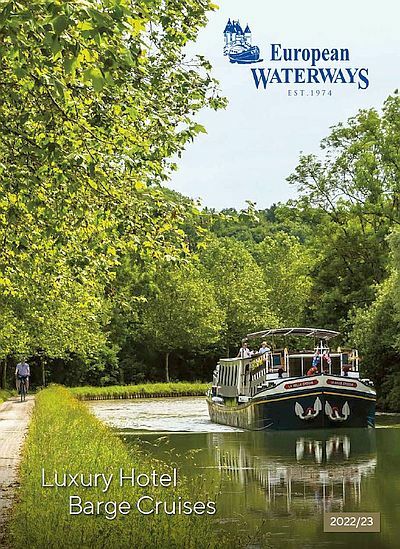 Return to the barge for a gourmet lunch (perhaps including the famous duck confit stew, cassoulet) and an afternoon’s cruise to La Croisade, with plenty of opportunity to walk or bicycle along the towpath. Dinner on board. After breakfast, we enjoy a tasting at “L’Oulibo”, the local olive oil press. After tasting those organic and wholesome olives accompanied by a glass of rosé, we take a short drive up the Gorge de la Cesse and into the hilltop village of Minerve. Your guide will regale you with the harrowing tale of the Cathar siege launched at Minerve during the 13th century. Relax after lunch on board, whilst we cruise to Capestang, or you can enjoy a wine tasting at a local château, such as Château Cabezac. Return to the hotel barge for dinner on board and admire the floodlit Collegiale St. Etienne. After breakfast, we take a trip to the weekly morning market in Narbonne. Even for non-shoppers, Narbonne offers much entertainment. Explore an excavated portion of the original Roman road, the Via Domitia, browse through the Roman Museum, discover the beauty of St. Juste Cathedral, or simply relax at one of the many cafés. After lunch in the atmospheric market, we return to Athos and cruise to Fonserannes. From our mooring tonight you will have a glorious view of the town of Beziers and the Cathedral St.Nazaire. Dinner on board. This morning we drive to the old market town of Pezenas, which was the first seat of the Languedoc court. The architecture is unique within this region because of the “Hotels Particuliers” or mansions belonging to the noble families who followed the Court. It is filled with artisans’ shops, including painters, hat makers, and costume designers. Once again, your guide makes sure that there is time to browse, as well as learning about the history. After lunch we begin our negotiation of a 17th century feat of engineering, the Fonserannes Staircase Locks. Then we traverse the 18th century aqueduct over the River Orb. The paved towpath and the many locks leading to our mooring make it an ideal afternoon for walking or bicycling alongside the barge. Dinner on board. 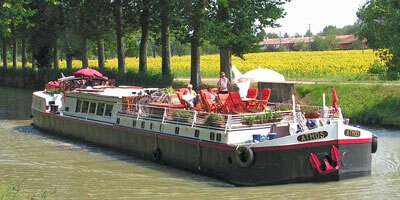 This morning, we get underway earlier than usual, cruising through the area known as the “Petit Camargue”. Bird watchers should look out for the local species such as pink flamingos, African Rollers and Bee Eaters. After crossing through the exceptional “round lock” at Agde, a spectacular and appropriate seafood lunch awaits you, as you enter the open-waters of the Etang de Thau, which boasts Europe’s largest mussel and oyster beds. As we moor in the port at Marseillan, you will notice the enclosure of the Noilly Prat vermouth distillery. End a perfect day with a fascinating tour of the distillery and if you choose, a tasting of Noilly Prat before the Captain’s Farewell Dinner on board. After breakfast, guests are transferred by private chauffeured minibus to their choice of location in Beziers**.